So why is it so difficult to gets kids to eat their broccoli? Or cabbage? Or peas or beans or kale or sprouts or any other of the tasty, wholesome little green marvels that nature provides and parents insist that their children consume? After all, the five-a-day health giving properties of fruit and veg are beyond doubt. And a portion of cooked broccoli - as I just discovered on the Green Giant Facebook page - contains more vitamin C than an orange! Yet children - by and large - tend to be extremely hard to please as far as eating their greens is concerned. Well, Green Giant wants to help families enjoy their 5-a-day, every day and they’re asking you for your favourite hints, tips and clever ways to encourage children to eat and enjoy their fruit and vegetables. They'd like to know what problems you have and what tips you can pass on to other parents when it comes to feeding kids their vegetables. And if yours is the top tip that I choose as having the potential to persuade the (ex) President of the United States (as well as my kids) you'll get to try out all the tips with a delicious Abel & Cole vegetable box plus Green Giant hamper. For your chance to win an Abel & Cole vegetable box , write your best tips/hints/advice in the blogger comment box before the 14/11/2011. Entrants must be over 18 and residents of the UK or ROI - Prize is one Abel & Cole vegetable box (no cash alternative) -There will be 1 winner. The winning post will be decided based on the following criteria: uniqueness/creativity/originality. 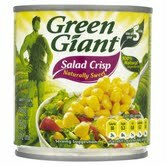 By entering the competition, you agree that your hint/tip may be shared on Green Giant’s Facebook page and used by Green Giant in any other media.